PHOTO FROM FILE: State Senator Lou Correa (left) and California National Guard Adjunct General, Brig. 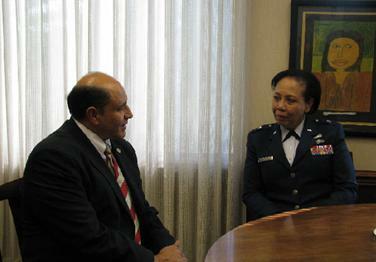 Gen. Mary J. Kight (right), at Senator Correa’s Capitol Office during discussions related to Senate Bill 1075. SACRAMENTO, CA – The California State Senate unanimously approved Senate Bill 1075 (SB 1075) authored by Senator Lou Correa (Orange County). This measure will require academic institutions to reasonably accommodate and assist students who are called to active military duty so they can meet any and all coursework requirements missed due to military service. “SB 1075 will make sure that California National Guard members will not be academically or financially penalized when they are ordered to perform emergency state active duty,” said Senator Lou Correa. The California National Guard routinely assists and responds to local and state authorities for various missions and emergencies within California. Many of these service men and women must leave their studies to respond to these state emergencies. Unfortunately, California’s higher education institutions have varying policies concerning academic leaves of absence for those students. There have been some instances in which post-secondary institutions have not extended these protections to California National Guard members who were ordered to perform Emergency State Active duty by the Governor. SB 1075 will require colleges to work with and assist the student so he or she is able to meet any and all coursework requirements that he or she may have missed due to military service. “This legislation will greatly benefit our soldiers and airmen by taking away the burden of choosing between service and education”, said Brigadier General Mary J. Kight, The Adjutant General of the California National Guard. SB 1075 will be considered in the State Assembly within the next few weeks.